Restaurants close all the time, and though each shuttering plays as a tragedy for the owner, most move on without much afterthought. Chefs swing to a new kitchen. Servers disperse to surrounding restaurants. Customers become regulars elsewhere. But when all 10 Here to Serve restaurants abruptly went dark overnight and left 650 employees (some say the number is over 1,000) without jobs, the industry was dumbstruck. Rumors circulated, lawyers geared up, and non-profits like the Giving Kitchen and other restaurants stepped in, encouraging H2S employees to submit their resumes (check Twitter with the hashtag #H2S2WORK). The reaction is a direct testament to the importance of this once-great empire, which owes all of its success to Thomas Catherall. Catherall, who in the 1980s was reportedly the highest-paid chef in Atlanta while at the Cherokee Town and Country Club, founded Here to Serve in 1996. At one time he operated as many as 14 flashy establishments, which thrived on one-word names (Prime, Twist, Shout, Strip, Noche, Goldfish, Aja, Coast, Shucks, Smash) and high-octane environments. 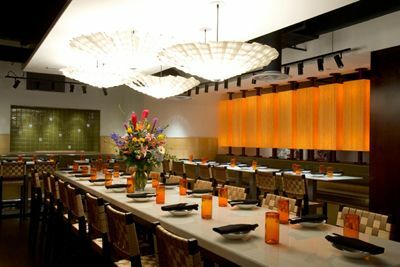 Indeed, Catherall introduced us to a less conservative style of dining, blending Asian flavors and Southern ingredients. He was first to mix steak and sushi. He pioneered small plates. He drove fast cars and he wore big watches. For all of the above, he was a polarizing figure, a culinary Donald Trump, especially among local food critics who lamented his approach—“the masses not the classes,” he once told me. In my mind, the former ragamuffin-turned-millionaire deserved more respect. The oldest of ten and born in the gritty industrial town of Newcastle upon Tyne in the northeast of England, he was always upfront about his intentions, opening in high-commerce areas such as Phipps Plaza, Lenox Square Mall, and Perimeter Mall. He had paid his dues in the kitchen as a masterfully talented chef and now was ready to cash in on creative ideas—ideas executed with a broad streak of populism. What’s wrong with that? He and his third wife, Leigh Catherall, ran the company together, but when the couple went through a protracted divorce that ended in 2014, she got the company, and he got to retire to Florida, where he threw himself into a life of deep-sea fishing and other adventures he documented aggressively on Facebook. The future remains murky for this once-great restaurant empire, which had to close after its payroll company withheld paychecks (Leigh Catherall’s request for injunctive relief was also denied). Though the company says that it’s “working on reorganization” on its website, Leigh Catherall told 11Alive that without substantial backing from investors, she couldn’t possibly turn the lights back on. In the meantime, the group’s core clientele—more women and more African Americans than comparable snazzy eateries—won’t soon forget the fun they had in the company’s heyday.